After 95 years, the Warwick Stakes now has a new name, Group 1 status and twice as big a purse – all in honor of the world’s best-ranked racehorse, Winx. The 7-year-old champion mare returns for what could be her last-ever racing season in this weekend’s $500,000 Winx Stakes. All that stands in the way of Winx bettering Black Caviar’s Australian record of straight wins is Godolphin star Kementari. The race runs at Sydney’s Randwick at 1 a.m. ET Saturday and sees Winx begin a quest for a record-breaking fourth-straight Group 1 Cox Plate victory in October that would exceed Kingston Town’s 1980-1982 hat trick. The fact that trainer Chris Waller's star mare could soon retire adds poignancy to her campaign. If she wins at Randwick this weekend, Winx will already go down in history. A victory would give the mare her 26th-straight win, beating Black Caviar’s undefeated 25 victories before retiring in 2013. Unsurprisingly, Winx is the strong favorite in the Stakes, at 3/25. She’s the reigning champion in the 7-furlong sprint the past two years, when it was run at Group 2 level. A hat trick would match the records of Kingston Town (1980 to 1982) and Limerick (1927 to 1929). Kementari, a son of Lonhro – who also sired Belmont Stakes runner-up Gronkowski– offers the best chance of a Winx defeat. The Godolphin racing empire is banking on the 4-year-old colt producing an upset on the strength of his three wins and four Top 3 finishes at group level earlier this year, including the Group 1 Randwick Guineas in March. Having already faced Winx in the G1 George Ryder Stakes back in March – finishing third behind the superstar mare and Happy Clapper – there is confidence for Kementari, who tends to perform better second-up. Jockey Glyn Schofield is confident. “We wouldn’t be in it if we didn’t think we could [win],” he said. “Clearly, he’s a very, very good horse so why can’t he?” The bookies give Kementari odds of 6/1. Chris Waller is equally optimistic that Winx, ranked the world’s best racehorse by Longines since March, will beat Black Caviar’s record. 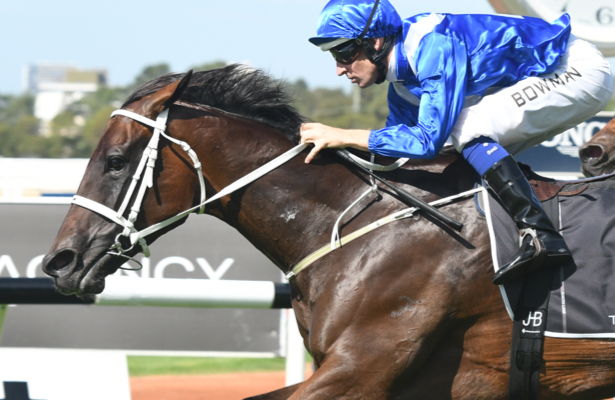 Waller’s remains confident despite Winx finishing third during a barrier trial two weeks ago. In that race, Alizee, who has been sidelined from the Stakes, stole the spotlight while Ace High, an early favorite for the Caulfield and Melbourne Cup, came in a length behind, with D’Argento finishing fourth behind Waller’s champion mare. The bookies give D’Argento a 10/1 chance for a win at Randwick, and Ace High outsider odds of 30/1. After the Stakes, Winx’s campaign will bring her back to Randwick for the Group 1 Chelmsford Stakes on Sept. 1 and the Group 1 George Main Stakes Sept. 15, followed by the Group 1 Turnbull Stakes at Flemington Oct. 6. The campaign finishes with the 2018 Cox Plate at Moonee Valley Oct. 27. This is the same route she took to complete her Cox Plate hat-track last year – and a fourth win at Moonee will make Winx an equine immortal. Many will be rooting for Winx to produce another historic feat this weekend. Will Kementari be the one to surprise and break her stranglehold on the race? Fans can tune into TVG to watch all the Winx Stakes races unfold live at Randwick, accompanied by on-site coverage from host Megan Devine. A former Managing Director of Sportech Racing, David Haslett was appointed President and CEO of Sky Racing World in April 2014. The Louisville, Kentucky-based company, a subsidiary of Australian wagering firm Tabcorp, provides Australian, New Zealand, South African and South Korean racing content for simulcast horse race wagering to multiple North America-facing ADW brands and racetracks.